DESCRIPTION Amazing 2 bedrooms with a den, fully upgraded townhouse facing the courtyard. The oversized tandem garage is big enough for a truck or two cars. Other units have entertainment space as part of the garage or would be a great art studio. From the front door, this on-trend home has all a full home can offer. Over $10,000 in upgrades quartz counter tops in kitchen & bathrooms. Stunning hardwood flooring, tile upgrades in kitchen & bathroom, window tinting, & all windows have blinds. The kitchen offers lots of storage, SS appliances wt an eat up bar & large pantry closet. Large west facing deck off the kitchen to enjoying summer sun or BBQ. The dining area can fit a large table for family dinners. Master bedroom is a great size wt walk-in closet & ensuite. Den offers a place to have your office, homework area or a playroom. 2nd bedroom is a generous size wt walk-in closets. The builders have finished all of the units! Groceries, Pub, Pet store and Gas station is about a 15 min walk!! Home for sale at 26 Walden Ph Se Calgary, Alberts T2X 4C4. 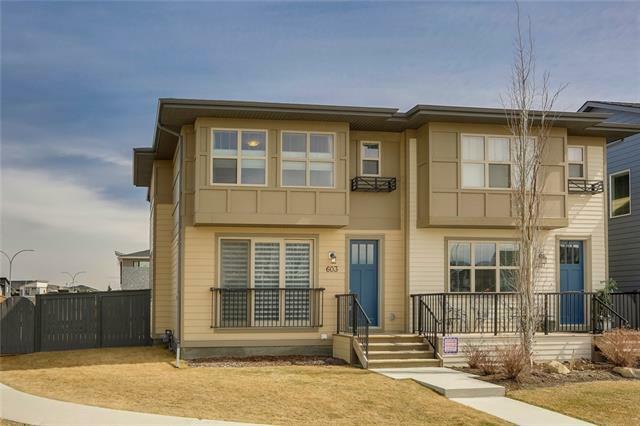 Description: The home at 26 Walden Ph Se Calgary, Alberta T2X 4C4 with the MLS® Number C4229735 is currently listed at $339,999.